Quaternary Geology is the branch of Geology aiming at the reconstruction of how the landscape evolved during the last 2.6 million years (i.e. Quaternary Period in the geologic time scale). The definition and reconstruction of natural and human processes that shaped the current environment are necessary to preserve archaeological, environmental and cultural heritage, and to assist local governments for proper maintenance planning. Data deriving from geomorphology (aerial photo interpretation, topographic and DEM analyses, field surveys and 3D elaborations), litho- and bio-stratigraphy (borehole logs, geologic cross sections, vegetal macroremains, palynology, pedostratigraphy), paleolimnology, archaeology and geotechnics are combined to investigate the recent sedimentary sequences, both outcropping and collected through coring. Our researchers are particularly interested in Lake Como (onshore and offshore) and Po Plain areas. On the left-top: Boreholes logs of the Lake Como. 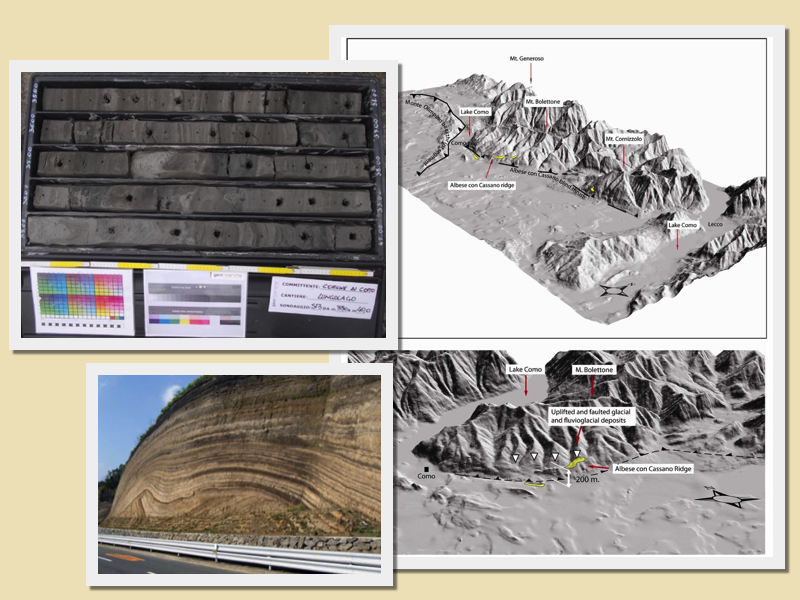 On the left-bottom: Example of stratigraphic sequence. On the right: 3D perspective view of the Lake Como area and the adjoining glacial outwash plain (Michetti et al. 2012). Contact us via Contact form! Leave your comments and Share our page! © 2019 PeriGeo. Realizzato con WordPress e OnePage Express Theme.